Looking for a great place to entertain your group? Check out our group rates! A 5% discount is available for groups of 10 or more skaters, with one person paying for the entire group. You must register your group in advance to receive a group discount. Please note: there is no outside food or drinks allowed with group discounts. Please note: Group discounts are limited to the above days and times only. Not valid with any other offers, packages, specials or discounts. No outside food or drink allowed. To bring in a cake or cupcakes, you must reserved a birthday party package. 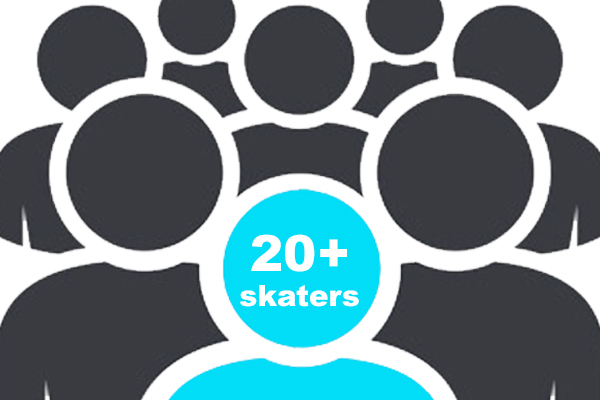 A 10% discount is available for groups of 20 or more skaters, with one person paying for the entire group. You must register your group in advance to receive a group discount. I understand that one person must pay for the entire group. (A credit card must be presented to the front desk to hold; no checks allowed).